Mount Tarawera, in the Central North Island erupted on 10 June 1886. One of the most popular tourist attractions in New Zealand was the Pink and White Terraces, which lay at the foot of Mount Tarawera, in the heart of the volcanic plateau of the North Island. Visiting tourists stayed at the Rotomahana Hotel in the village of Te Wairoa. From there they were carried by boats across Lake Tarawera to Te Ariki village, and, after walking to Lake Rotomahana, they were paddled in canoes to the foot of the terraces. 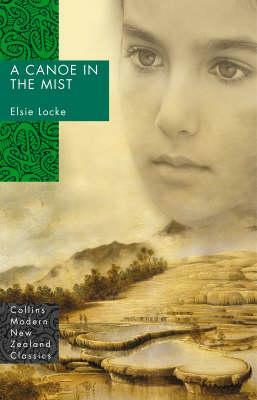 On 1 June 1886, a party of tourists claimed to have seen a Māori war canoe appear out of the mists on Lake Tarawera. It was being paddled by Māori in traditional dress, and disappeared when only half a mile from the tourist boat. A tohunga, or Māori priest, in Te Wairoa claimed that it was a waka wairua, or spirit canoe, and that it was an omen of a great calamity which would strike the land. On 10 June, early in the morning, people were wakened by violent shaking of the ground. Outside, the sky was lit up by lightning flashes. Eyewitnesses later reported that Mount Tarawera had split open, and that a huge column of fire could be seen shooting up into the air and forming a black cloud of smoke and ash. Molten rocks were flung out of the volcano, landing in the lake with a hiss. Just before 2am the sky darkened again. A rain of rocky ash and mud fell from the huge black cloud. People watching took refuge in the houses and whare of Te Wairoa. The ground kept shaking, and a hail of ash and hot mud struck the village. Some houses, with their inhabitants still inside, were buried. Other houses were left empty as their owners fled the village. One of the two buildings to survive the eruption was the whare of a Māori guide, Sophia. More than 60 people sheltered there during the night. The other building was the runanga or meeting house. At the Rotomahana Hotel, the inhabitants had to first leave one room when the roof collapsed under the hail of ash, rocks and mud, and then the entire hotel. One guest died when the hotel veranda collapsed, but others made it to safety in the guide’s whare. The schoolteacher and five of his family were buried under tons of mud and ash. Others in the house managed to escape and sheltered for the rest of the night in a chicken house. About 6am the flood of ash and mud from the sky eased, but it remained dark for another two hours. When survivors came out of the shelter, they found that the village of Te Wairoa had been buried under a sea of mud. As the survivors were making their way to Rotorua 16 kilometres away, they were met by a rescue party. The male survivors turned back with this party to Te Wairoa, while the women and children kept on to Rotorua. For some days the rescuers dug through the mud and ash. The schoolteacher’s wife was found alive, and the tohunga who had predicted the disaster was also dug out alive, but he died soon afterwards. A rescue party also headed across the lake to check the other settlements. They found the villages of Te Ariki and Moura both buried completely under the volcanic mud. There were no survivors. Lake Rotomahana had disappeared, leaving a valley of craters, steaming holes and pools of hot mud. The Pink and White Terraces had been completely destroyed, broken or buried under tons of lava. The surrounding hills were covered in ash and mud. 153 people were estimated to have died (15 at Te Wairoa). Before the eruption Mt Tarawera consisted of three peaks. The first peak to erupt was the Wahanga peak, furthest to the north, at about 1:30am. This was followed by the middle and highest peak, Ruawahia, and then the most southern, Tarawera. The roar of the eruption was heard hundreds of kilometres away, even as far as Christchurch and Auckland. It was estimated that more than 2 billion cubic yards of ash were scattered over an area of more than 6000 square miles. The surrounding Tikitapu bush was reduced to skeletal remains by the ash. Other areas of forest were flattened by the blasts as if by a mighty wind. Lake Rotomahana gradually refilled the crater blasted apart by the eruption, and grew to four times its original length, with a water level 30 metres higher than before. Mt Tarawera still stands on part of the series of fault lines, which forms the Pacific “ring of fire”. Today there are 10 craters along the line of the rift that split Tarawera. The craters of Mt Tarawera at Rotomahana and Waimangu are still active today. The village of Wairoa has been excavated to show where people lived and died. The area is ringed in poplar trees that have grown from the fence posts buried in the eruption. The terraces were formed as water containing silica flowed from the boiling geysers at the top down the hillside. The water cooled and crystallised into the terraces and pools, forming giant staircases or waterfalls. Te Tarata, the White Terraces, fell 30 metres from a geyser that produced the white silica of the terraces. These terraces spread out and down for about 240 metres. The water in the pools was a clear blue. Otukapuarangi, the Pink Terraces, were about 1.5 kilometres across the lake from the White Terraces. These terraces were wider at the top, about 73 metres, and then narrowed as they fell to measure about 23 metres down on the shore of the lake. The pools formed on these terraces were used for bathing, usually on the lower levels where the temperature of the water was lukewarm. In 2012, scientists discovered large portions of the Pink and White Terraces intact on the bed of Lake Tarawera. Tarawera and the terraces, Philip Andrews, Auckland, 1986. The Tarawera eruption, Kevin Boon, Petone, 1990. Tarawera: the destruction of the Pink and White Terraces, Geoff Conly, Wellington, 1985. Scientists claim pink terraces have been found, Friday March 16, 2012, Source: ONE News. TVNZ website. 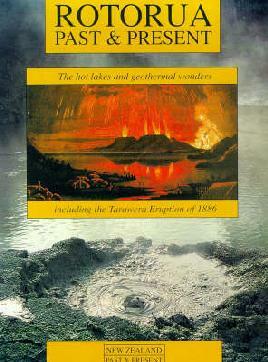 Read about the Mt Tarawera eruption on Te Ara. Tarawera - view this 2000 documentary about the 1886 eruption of Mt Tarawera and the destruction of the Pink and White Terraces.